1944 Van - 12k miles! More original photos that capture E83W vans. As more photos come to light, I'll try to feature them here. Sources, where known, will be mentioned. 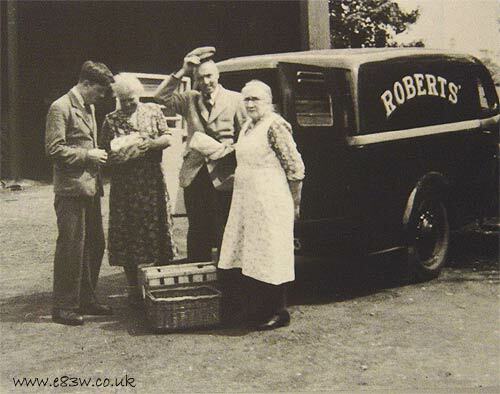 Here's a very period picture showing an E83W delivering bread to a small farm in Plumley, Cheshire. 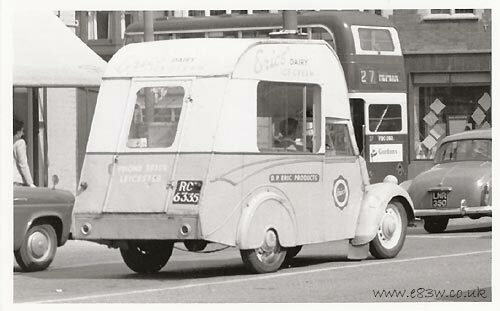 Eric's Dairy Ice Cream van seen here cruising around the Leicester area (presumably) in the late 1950s, or early 1960s I'd guess. It is seen here, powering away from the camera, passing a parked Ford 100E and soon to pass a parked, Manchester-registered, saloon - is it a Humber or a Vauxhall, I can't remember!! This E83W is interesting as it features a very strange style of coachwork, using only the front wings and bonnet of the original vehicle. Even the front doors are coachbuilt. The E83W was available as a chassis/cab, or, as in this case, a chassis/scuttle, to allow 3rd party coachbuilders to fit their own special-purpose body styles. It looks like it has led a hard life, the front wing has a healthy dent in it, the paintwork looks a little scabby, and judging by how low it sits on its springs, this was probably a hard-worked example. I was sent this picture by a visitor to the site - source unknown. This may be a press photo, I'm not sure, so have put it on this misc photos section. There are no details in the back of this photo so information is in short supply. 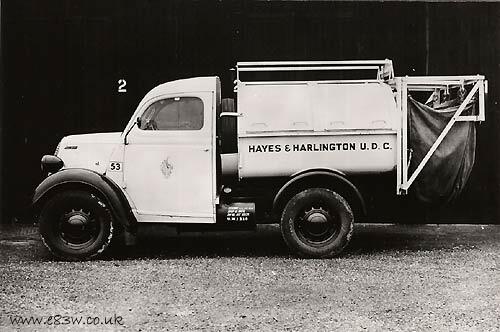 The E83W shown here is fleet number 53, and is operated by Hayes & Harlington U.D.C. - council presumably. It'd be great if one of these bodystyles has lasted into preservation - are any other there? I'd really like to find a body like this to fit on one of my chassis/cabs. Can anyone provide a lead on survivors? Photo source unknown - I bought this at a classic show a while back. Another photo scanned and sent to me recently. I don't know much about this one either, although I think I read somewhere once that the vehicle still exists, sadly without the barrel. If anyone knows where the barrel, or something similar, is, please let me know! 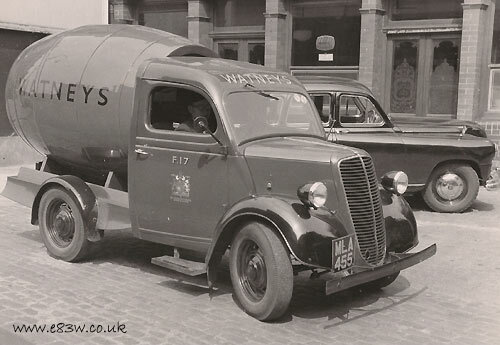 Alongside is a Phase 1 or 2 Standard Vanguard, both photo'd in the 1950s outside a Watneys watering hole. Interesting to note the chrome headlamp rings (fitted 1952/3 only I think), a panelled in roof section, and slightly extended cab. The grille, as on so many E83Ws, has received a little nerf at the bottom. No Ford bonnet badges fitted, yet beaded edge wings are present - 1952ish was a transitional era I think. 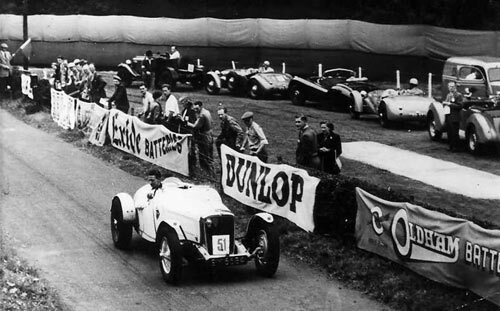 A view of the Bo'ness hillclimb, taken in the 1950s. An E83W can be seen lurking on the righthandside. Please do not reproduce any item found on this website in any format, or hotlink directly to images hereon, thanks.